>> Just as in Lake Wobegon, where all the children are above average, I think all the kids I know might be a bit brilliant. A>> new study suggests that babies who are messy eaters are quicker learners than their neat and tidy peers. And from where I’m sitting, that means every single 2-year-old is destined for the Ivies. Researchers at the University of Iowa gave a group of 16-month-olds a variety of sloppy foods and studied whether the children remembered a set of made-up names for the substances. Using foods like soup and applesauce, they judged whether the toddlers could recall the names when the foods changed shape — like going from a bowl to a tray. Kids who really dug into the foods and used their hands to squish, squeeze, and manipulate remembered the foods’ names much more readily than those who used utensils and focused on actually eating. This makes a lot of sense — research has long shown that the more of our senses we employ, the more we retain information. That’s why it’s easier to remember someone’s name after you’ve written it down and said it aloud. The research isn’t all bad news for fastidious moms. They also found that children who ate meals at a high chair — instead of sitting at a table — learned quickly as well. Researchers theorize that this is because kids know they can get their high chairs as messy as they want, so they feel free to paint masterpieces with their hummus or construct mashed potato mountains. If my dining room is any indication of what two toddlers can do when presented with sloppy foods, I can only imagine what the labs looked like after 70 kids demonstrated their burgeoning brilliance. No one would ever accuse me of being a neat freak, but even I have been shocked at the messes my kids can make during dinner or lunch. I guess next time I’m scrubbing milk off the ceiling (true story) or melted cheese out of the AC vents (also unfortunately true), I can remind myself that my kids are building brain power. 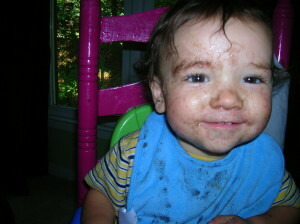 The picture above is my older son, Elliott when he was 9-months-old and experiencing black beans for the first time. Do you have a messy kid pic? Share your messy kid photos with us on Facebook!